One or two or three or four ‘letters’ from Norway to go. Let’s see, there’s this one about Lyme disease and walking in the rain. Then one about butter accompanied by animal pictures (and no, the animals in question are not being braised, sautéed or fried in that deliciously golden salty Setesdal Valley butter). And then there’s saying goodbye to Neset, and Olav and Solveig, and a quick look from the window of the train from Kristiansand to Oslo this fine sunny day. Oh yes, and a final sign off from Oslo in a few days. So about my brief but momentarily scary bout of Lyme Disease. I’m proud of myself for not panicking (not that there’s really anything to panic about if you do some research…) and calling my Albuquerque doctor or going to a clinic here or even feeling overly sorry for myself. I did send my brother a whiny email but he didn’t respond … so much for whining. The Woodtick: The story goes like this…Norway has woodticks that carry Lyme disease just as we do in the states. Word apparently got out in woodtick world that I find Norway to be perfect…and a particularly grumpy one decided to put a pucker on paradise and attach itself to me. By the time I realized it, the poisoning deed was done. Two days after the discovery I developed an odd assortment of aches and tingles and weaknesses and a horrendous headache—took me part of the day to realize what it was…but here’s the brilliant part. My RA doctor always supplies me with a round of antibiotics before I leave on one of my long trips because I once developed a worrying infection in some far off place where the healthcare system was iffy. Of course this isn’t the case in Norway but who wants to spend time finding a doctor when you’ve much better things to do…voila, my pills were at hand. I’ve only finished the second day of the seven-day regimen and I already feel generally fine, but of course I’ll continue until the end. My tiny dead friend is a revolting-looking specimen, almost like a miniscule cross between a spider and a beetle. I’m bringing him home in case I go truly mad and the doctor needs to examine the source. Doesn’t this look like where a tick would live? 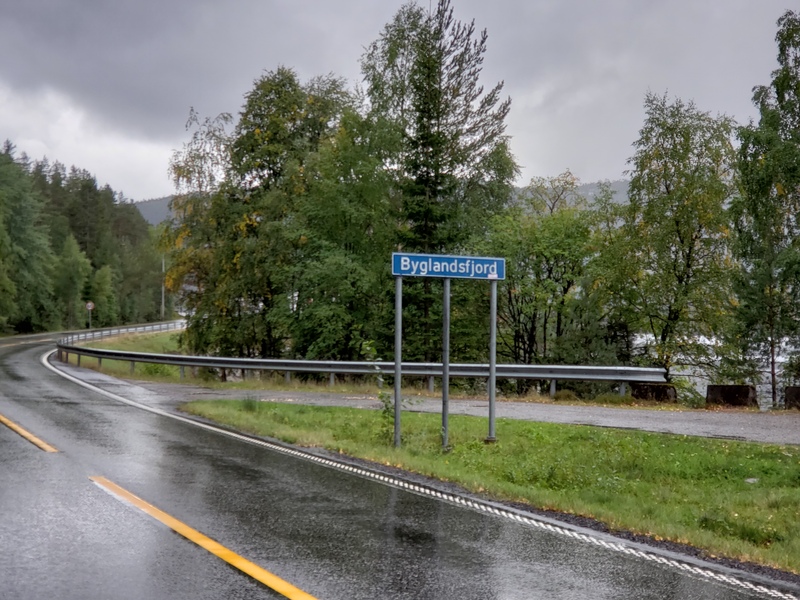 Up the Hill and Round the Bend to Byglandsfjord I Go: On one of the glorious days of rain, I donned my Svalbard heavy-duty hiking sneakers and rain jacket and walked the two/three kilometers from Neset Camping to the village of Byglandsfjord. And a lovely walk it was. I tried to absorb enough fresh air and fresh water and fresh plant matter to last a few New Mexico months. There is zero pollution or dust here. Zero. I stopped at the Revsnes Hotel on the edge of town for tea, wandered about the drizzly streets, full of late summer’s fallen green apples and bright gold zinnias, went to the grocery store, and stopped back at the hotel for a wine on the way home. Pictures. Of course. You need pictures. The walk in the rain.